The number of passengers that travel by AVE to Zaragoza increases without stopping, clearly dismantling the car, the plane and the bus, because if we consider gas prices, jams, waits, plane and bus prices with their respective discomforts, etc., the AVE is definitely the best option possible to travel cheap, fast and without any discomfort to Zaragoza. The main train and AVE station in Zaragoza is the station AVE Zaragoza Delicias. But we also have many other connections by AVE with Zaragoza from other localities, because due to its importance, size and geographical situation, Zaragoza has historically been a very well communicated city with the rest of Spain, so we can also ensure that we have the best prices on AVE Ciudad Real Zaragoza tickets, AVE Huesca Zaragoza tickets, AVE Puente Genil Zaragoza tickets, AVE Guadalajara Zaragoza tickets, AVE Calatayud Zaragoza tickets, AVE Girona Zaragoza tickets, AVE Puertollano Zaragoza tickets, AVE Lleida Zaragoza tickets, the cheapest AVE Tardienta Zaragoza tickets, AVE Figueres Zaragoza tickets and the cheapest AVE Tarragona Zaragoza tickets. With this more than complete offer to travel by AVE to Zaragoza at the lowest prices and the best offers, we should not miss the opportunity to visit Zaragoza at high speed, comfort is total, since in addition to travelling on your comfortable seat, once you arrive to Zaragoza on AVE, we will get off at the Delicias de Zaragoza station, which is central and very well connected and has different bus stops and taxi service next to the station. Travel with the cheap AVE Zaragoza tickets and don't miss the Real Maestranza de Caballería de Zaragoza, the Aljafería, the Lonja, the Tower of La Zuda, and of course the Basilica del Pilar and the Plaza del Pilar. If, for example, we travel by AVE Madrid Zaragoza, compared to a bus trip, which would take us more than 5 hours, with prices higher than the AVE Madrid Zaragoza, travelling by AVE we are doubtlessly gaining travel quality. And we have 19 trains AVE Madrid Zaragoza, which depart from Atocha and that leave us at the station Delicias, without transfer, and some of their departures are in fact direct, that is, they don't stop at any intermediate station. During the last few months, especially the sale of the AVE Barcelona Zaragoza tickets, the AVE Madrid Zaragoza tickets, the AVE Sevilla Zaragoza tickets, the AVE Málaga Zaragoza tickets and the AVE Córdoba Zaragoza tickets have increased enormously. The first AVE Madrid Zaragoza leaves at 06.20 and arrives in 1 hour and 21 minutes to Zaragoza, the second AVE Madrid Zaragoza starts its route at 07.30 and also arrives in 1 hour and 21 minutes to Zaragoza, the third AVE Madrid Zaragoza is a bit faster and completes the route in one hour and fifteen minutes, this AVE departs at 08.30. If we travel from Barcelona with the best prices on AVE Barcelona Zaragoza tickets, we have 19 departures of the AVE Barcelona Zaragoza and most people reject other means of transport- Also in the case of travelling from Barcelona to Zaragoza, because travelling by plane is more expensive than our cheap AVE Barcelona Zaragoza tickets, and the prices and duration of the bus trip are clearly worse than those of the AVE. By car we spend more on gasoline and tolls than on the amount of tickets AVE Barcelona Zaragoza, so here we have the answer to why the AVE is the best of all means of transport to travel to Zaragoza. The city of Zaragoza is known, among other things, for its historical beauty and the basilica of Pilar. Its geographical location facilitates the visit, especially since the AVE was launched. The AVE went into operation at Zaragoza Delicias station in 2003 and its use continues to increase. Since its inauguration, the number of routes has been increasing and now we can reach Zaragoza through the AVE from different locations, for example from Barcelona, ? ?Seville, Antequera, etc. 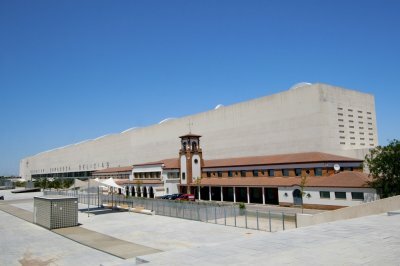 This train station, called Zaragoza Delicias, was opened with great enthusiasm in May 2003 and in a few months it would bring the line that would link Madrid with Zaragoza. It was a station that did not take long to become one of the busiest train stations in all of Spain. The station is wide and offers services of both Medium Distance and High Speed. In addition, it shares enclosure with the bus station. Its architecture is highly attractive and the view from the outside is impressive. It has a rather imposing character. The architects who were in charge to realize this work rail were Carlos Ferrater and Jose Maria Valero, with Felix Arranz and Elena Mateu. It has 10 tracks, some of Iberian width and others adapted for high speed lines, that is, of international width. It is said that in the first instance, they wanted to build a Museum of the Aragon Railway within the same railway station, but for now, this wish has not been fulfilled. Another element to emphasize to the proximities of the station is the Gateway of Delicias. It is a pedestrian bridge linking the station Delicias and the neighbourhood of La Almozara and this bridge was built between 2007 and 2008 for the Expo 2008. This massive construction was funded by the Zaragoza High Speed ? ?Society and it is a work of the engineer Juan José Arenas. The bridge has a total of 240 meters. From the station you can easily reach any place, as it is very well connected with the rest of the city by bus, as well as intercity buses if you need to go to a more rural location. Zaragoza offers several interesting tourist attractions as well as good restaurants and avenues to walk around. It is the fifth largest city in Spain. In it we find remains of past civilizations, especially of the Roman Empire. You can visit the thermal baths, the Roman theatre, the Roman wall, etc. If you are interested in the subject, there are routes through the Roman Caesaragusta in which you will be told many attractive stories. The city does not only contain Roman heritage but it also mixes with many other cultures: the Muslim, Jewish and Christian legacy. The city is full of museums, culturally prepared to meet different kinds of interests. One can highlight the Pablo Gargallo Museum dedicated to the work of the Aragonese sculptor Pablo Gargallo. Another museum to highlight is the History Centre of Zaragoza in the old convent of San Agustín. In it, we see the historical-cultural development of the convent, where archaeological evidence of Iberian, Roman and Muslim culture has been found. It became after that the convent of San Agustín. Later, it was converted into the Quarters of Military Intendency. It was established there around the 19th century. Its monuments also portray the cultural diversity of this city.